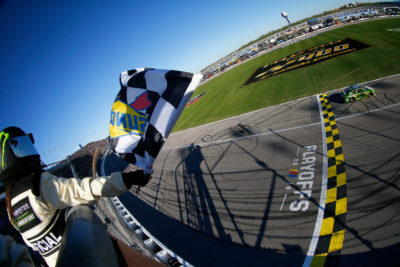 Credit: 358325(Photo by Jonathan Ferrey/Getty Images) Chase Elliott, driver of the #9 Mountain Dew Chevrolet, crosses the finish line to win the Monster Energy NASCAR Cup Series Hollywood Casino 400 at Kansas Speedway on October 21, 2018 in Kansas City, Kansas. 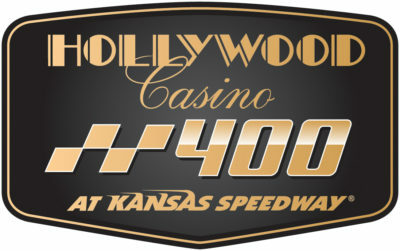 races at Kansas Speedway. It is his 25th Top 10 finish in 2018. 3rd Place Car 42 Kyle Larson McDonald’s Trick. Treat. Win! Chevrolet, started from 27th place posted his 4th Top 10 finish in 10 races at Kansas Speedway. Great effort by Kyle Larson but he needed a win to make the next round of the playoffs. 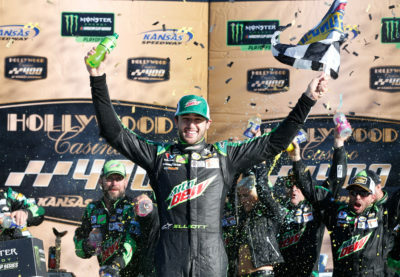 Credit: 358322(Photo by Brian Lawdermilk/Getty Images) Chase Elliott, driver of the #9 Mountain Dew Chevrolet, celebrates in victory lane after winning the Monster Energy NASCAR Cup Series Hollywood Casino 400 at Kansas Speedway on October 21, 2018 in Kansas City, Kansas. 4th Place Car 20 Erik Jones Craftsman Toyota, started from 6th place followed by 5th place Car 78 Martin Truex Jr. Bass Pro Shops/5-hour ENERGY Toyota, started from 12th place. 6th Place Car 2 Brad Keselowski Discount Tire Ford, started from 5th place followed by 7th place Car 12 Ryan Blaney Menards/Wrangler Riggs Ford, started from 4th place. 8th Place Car 22 Joey Logano Shell Pennzoil Ford, started from pole followed by 9th place Car 88 Alex Bowman Nationwide Chevrolet, started from 10th place. Lastly in the Top 10 was Car 10 Aric Almirola Smithfield Ford, started from 3rd place. Bubba Wallace (26th) was the highest finishing rookie. Kevin Harvick (P) leads the point standings by 13 points over Kyle Busch (P). 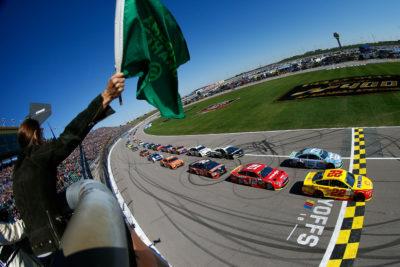 Credit: 358315(Photo by Jonathan Ferrey/Getty Images) Joey Logano, driver of the #22 Shell Pennzoil Ford, and Kevin Harvick, driver of the #4 Busch Light Ford, lead the field at the start of the Monster Energy NASCAR Cup Series Hollywood Casino 400 at Kansas Speedway on October 21, 2018 in Kansas City. The race had 3 Cautions for 17 Laps: 1st Caution on lap 58 for #24 Fluid On Track. 2nd Caution on lap 82 for Stage 1 Conclusion. 3rd Caution on lap 162 for Stage 2 Conclusion. 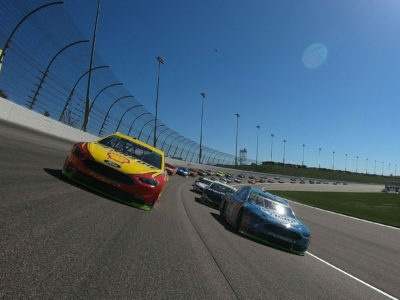 Credit: 358317 (Photo by Chris Graythen/Getty Images) Joey Logano, driver of the #22 Shell Pennzoil Ford, and Kevin Harvick, driver of the #4 Busch Light Ford, lead the field at the start of the Monster Energy NASCAR Cup Series Hollywood Casino 400 at Kansas Speedway on October 21, 2018 in Kansas City. The race had 15 Lead Changes among 8 drivers. Lap Leaders: K. Busch (P) 1-15;K. Harvick (P) 16-74;R. Stenhouse Jr. 75-81;K. Harvick (P) 82-126;J. Logano (P) 127-128;K. Harvick (P) 129-189;B. Keselowski (P) 190;K. Busch (P) 191-194;K. Harvick (P) 195-242;C. Bowyer (P) 243;K. Harvick (P) 244-320;K. Busch (P) 321-322;A. Almirola (P) 323-341;B. Keselowski (P) 342-348;A. Almirola (P) 349-393;C. Elliott (P) 394-404. Leaders Summary (Driver, Times Lead, Laps Led): Kevin Harvick (P) 5 times for 290 laps; Aric Almirola (P) 2 times for 64 laps; Kyle Busch (P) 3 times for 21 laps; Chase Elliott (P) 1 time for 11 laps; Brad Keselowski (P) 2 times for 8 laps; Ricky Stenhouse Jr. 1 time for 7 laps; Joey Logano (P) 1 time for 2 laps; Clint Bowyer (P) 1 time for 1 lap. 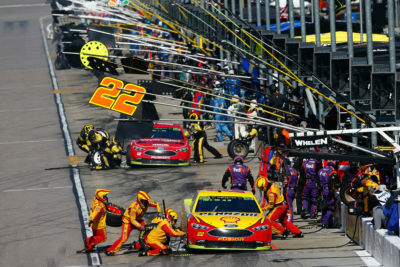 Credit: 358319(Photo by Jonathan Ferrey/Getty Images) Joey Logano, driver of the #22 Shell Pennzoil Ford, pits during the Monster Energy NASCAR Cup Series Hollywood Casino 400 at Kansas Speedway on October 21, 2018 in Kansas City, Kansas. Credit: 358326(Photo by Brian Lawdermilk/Getty Images) Chase Elliott, driver of the #9 Mountain Dew Chevrolet, poses with the winner’s sticker after the Monster Energy NASCAR Cup Series Hollywood Casino 400 at Kansas Speedway on October 21, 2018 in Kansas City, Kansas. Race Comments: Prior to the start of the race, the following cars dropped to the rear of the field under penalty for the reasons indicated: Nos. 1, 66 (engine change), 42 (backup car). Failed to Qualify: None. Time of Race: 2 Hrs, 38 Mins, 2 Secs. Average Speed: 152.713 MPH. Margin of Victory: 0.903 Seconds. Caution Flags: 3 for 17 laps. Lead Changes: 11 among 8 drivers. American Ethanol Green Flag Restart Award: Kyle Busch, #18. Fastest Lap: Kyle Larson, #42. Mahle Clevite Engine Builder of the Race: Toyota Racing Development (TRD), #18. Mobil 1 Performance and Protection: Ricky Stenhouse Jr, #17. Moog Go the Extra Mile: Clint Bowyer, #14 crew chief Mike Bugarewicz, -0.050 seconds. Sunoco Rookie of the Race: William Byron, #24.